By David Ponce on 11/04/15 • Leave a comment! One of the many indignities suffered by those having to live in cramped downtown apartments is the lack of sunlight. Granted it’s a tradeoff from having to mow the lawn and clean out the gutters, but that’s still no reason to dream about being able to eat your cake and have it too. Argentinian architect Aldana Ferrer Garcia thought of a solution and invented the MoreSky Windows. 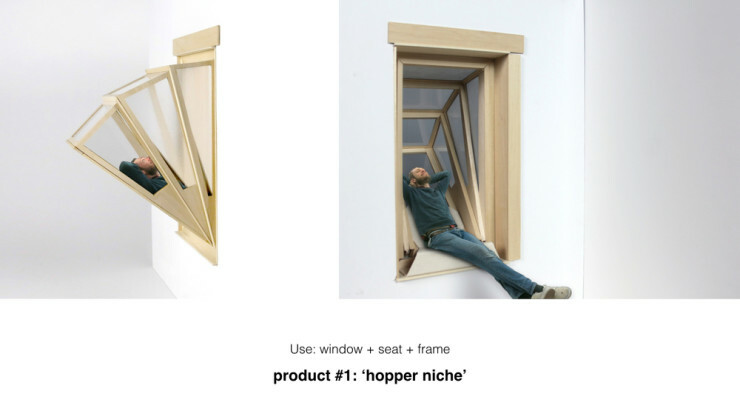 They look just like normal windows but have a hinged telescoping mechanism that lets you lean back on them and stare at the sky. It also looks like you might fall to your death, so we suppose you can consider this a thrill-seeking adventure type product as well as a cool new way to get more daylight. Unfortunately, it looks like this is just a concept from Mr. Garcia, and isn’t a product you can buy. By David Ponce on 07/28/15 • Leave a comment! Building stuff out of LEGO is great, but you’re always aware that you’re looking at LEGO pieces; stuff made like this has a distinctive look and feel to it. But if you’re into creating more realistic structures, Arckit may have what you’re looking for. 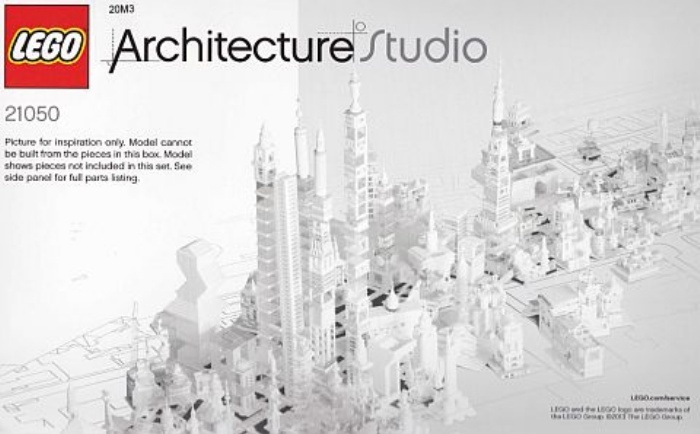 It’s dubbed “The Architectural Model Building Tool”, and contains modular pieces allowing you to construct modern looking homes in all shapes and forms. 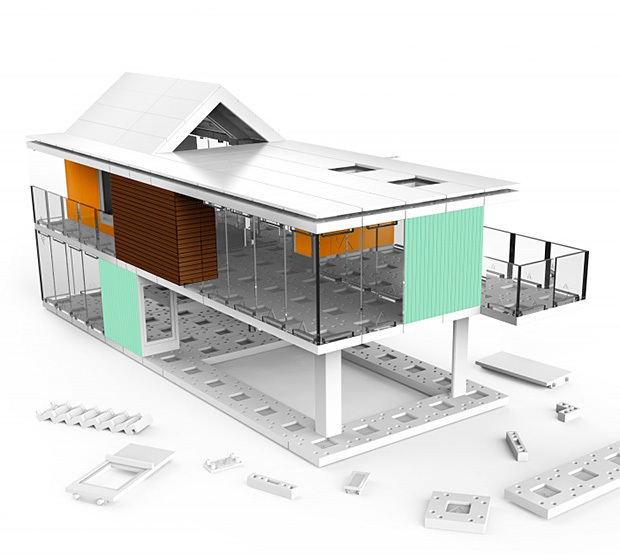 ARCKIT is a freeform model building tool that allows architects and everyone to physically explore designs and bring their projects to life. The interconnecting components use no glue and are completely modular, making it possible to create a diverse range of scaled structures that can be used as working models to communicate ideas to clients and to showcase finished projects. The kits come in four sizes, called AGo, A60, A120, and A240. The numbers represent the possible maximum floor area in square meters, and kits feature 160+ pieces, up to 620+ pieces for the A240. Additional component packs can be purchased, although prices for the entire range are not on the lower side. AGo costs €59.99, or roughly $65USD, while A240 will set you back a hefty €339, or about $376USD. A few years back LEGO launched their Architect Series with what is probably the most famous house ever built; Frank Lloyd Wright’s Fallingwater. 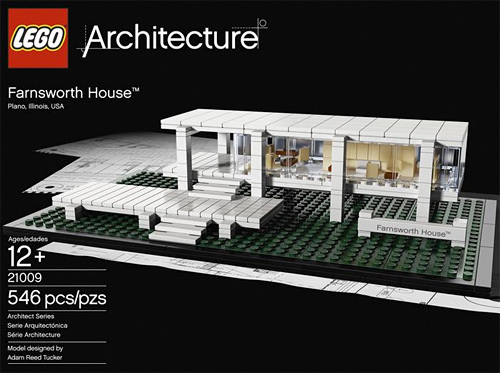 It was an obvious choice to start with, but now as the collection has grown I’m happy to see they’ve recently added another famous landmark, and one of my personal favorites, the Farnsworth House. Located 55 miles southwest of Chicago in Plano, Illinois, and designed and built by Ludwig Mies van der Rohe for Chicago medical specialist Dr. Edith Farnsworth, the house has become an icon of the International Style of architecture, and can now be yours. Of course some assembly is required, 546 pieces worth to be exact, and the set even includes miniature LEGO versions of Mies’ furniture inside. $59.99 available directly from LEGO’s online store. We don’t cover a lot of architecture here on OhGizmo!, unless it brings something more than just a clever design to the table… err structure. But I felt compelled to share this amazing office space, particularly with those of you stuck in a cubicle environment. I know how soul sucking they can be… I’ve been there… but as you can see there’s always hope that there’s someplace better out there. 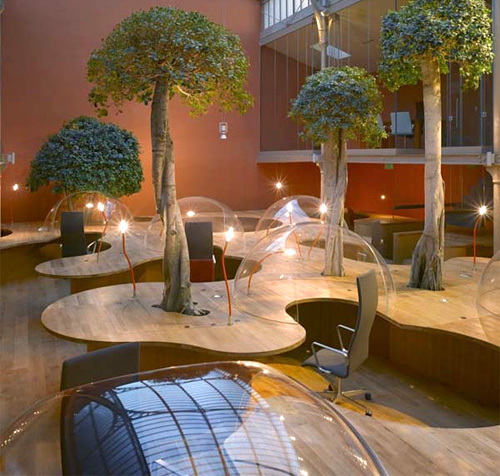 In this case the ‘someplace’ is the offices of PONS + HUOT, designed by the French firm Christian Pottgiesser Architects. It’s a beautiful example of how sharing a workspace doesn’t have to involve felt walls and speckled gray desktops. 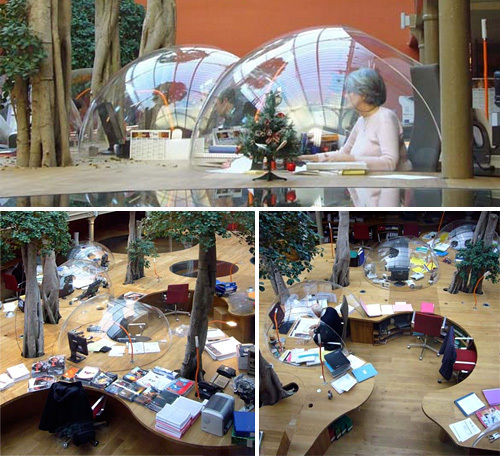 The giant organically shaped wooden desk provides endless real estate for employees to pull up a chair and work, and those who don’t necessarily want to collaborate or be disturbed can take refuge in a series of clear plexiglas domes that provide a bit of solitude. The trees sprouting up through the desks are a nice touch too, but what you can’t see in the handful of photos I’ve included are the meeting rooms cleverly hidden below the desk, so head on over to the Christian Pottgeisser Architect’s website to see the entire gallery of this amazing creation. I love me a good science center, but I particularly like it when the actual building manages to educate as much as the exhibits inside do. Case in point, the The Swiss Technorama Science Center in Winterthur, Switzerland. Way back in 2002 they hired Ned Kahn to design a unique facade for the building which consisted of thousands of small aluminum panels that move with the air currents revealing the patterns of turbulence in the winds. Obviously the still shots don’t do it justice, so if you have a few minutes I highly recommend checking out the video below to see it in action, it’s quite hypnotic. While it’s not the first underwater hotel (that honor goes to the Poseidon in Fiji) a new hotel being built in Istanbul hopes to set itself apart from its competitors since it’s being built on the ruins of a historical 1930s tobacco factory in the city center. 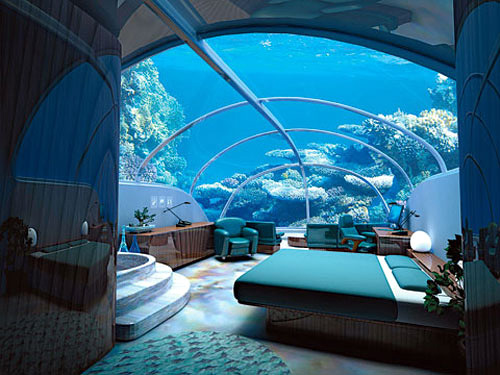 The hotel will have 7 floors all underwater and every room will have a view of the sea. Of course no one’s really sure how great that view will actually be since local experts claim the visibility in the Istanbul Bosporus Strait is only about 10 feet. However the hotel is on track for a 2010 opening, which will coincide with the city taking over from Linz, Austria as the Cultural Capital of Europe. It’s being build by Tanriverdi Holding who have promised a multi-million dollar budget to ensure the hotel is finished to 7-star standards, and that it’s also 100% waterproof. 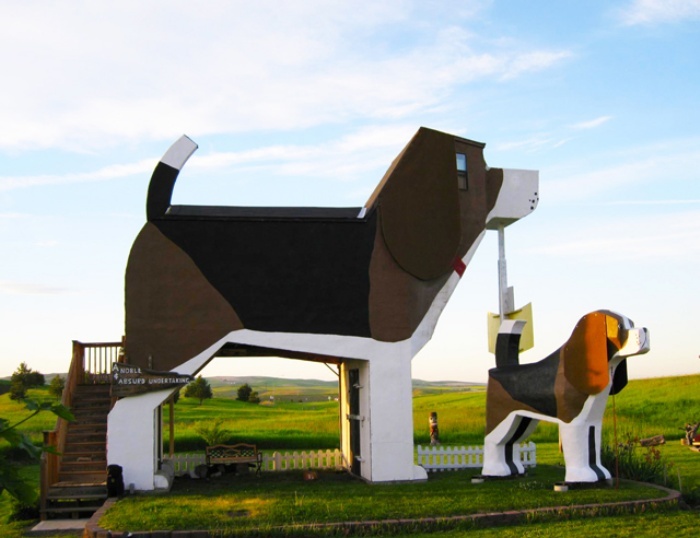 I know what you’re thinking, the neighbors must love this guy, but it’s not what you think. This isn’t one of those ‘tacky Christmas decorations all year round’ kind of house. In fact the building and an adjacent one have been used for exhibition space and art classes for over 30 years and they’re both scheduled to be torn down to make way for a new larger structure. 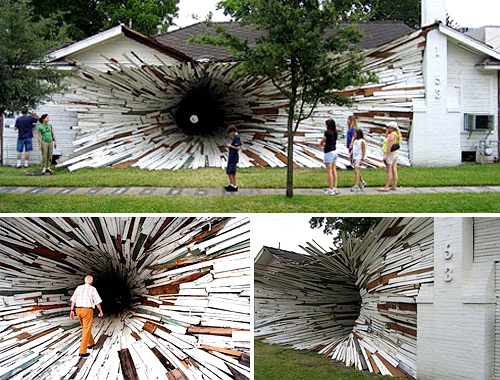 So as a final farewell to the buildings local Houston artists Dan Havel and Dean Ruck turned them into an art installation known as ‘Inversion.’ Using boards from the outside of the houses they created a large funnel-like vortex running between the two that ends in a small hole in an adjacent courtyard. It’s a cool effect particularly for those who always wanted to experience a black hole without the whole ‘being crushed to a quantum singularity’ end result. Unfortunately if you were hoping to catch a glimpse of the Tunnel House in person you’re probably too late. The public opening for the installation was held on May 21 and the houses were set to be demolished in early June. But there’s nothing stopping you from doing this to your own home.